This post started as an idle stroll down memory lane: My college roommate has family on Block Island and took me there on a couple of day trips, and then I took my parents there on longer visits, so when I bought my first dog-oriented New England guidebook I turned to the entry for Block Island and found…well, very little. The Dog Lover’s Companion to New England lists and describes a number of parks on the island that allow leashed dogs to visit, but the only pet-friendly hotel it mentions is the Blue Dory Inn (the AAA PetBook came up blank). Could that be it? Soon the phone was getting a workout, and here are the results. I would love to get your feedback about the activities and places I’ve described, and to hear about any others you and your dog have enjoyed — please send me a comment or an e-mail! Whenever I spent the night on the island, I stayed at the Surf Hotel, now closed, so I can’t give you personal feedback about these properties. My best advice is to check them out on Tripadvisor, or with a Google search, before booking. The Blue Dory Inn allows dogs in any of its cottages or suites with an outside entrance, plus one room in the inn itself which has an outside entrance — for a total of eight pet-friendly rooms. The inn does not have a maximum pet weight, but does charge $25 per pet, per visit. Dogs are not to be left unattended in your room; if you do have to step out to dinner, however, they’ll understand (but they request that you leave your cell phone number with them in case an issue arises while you’re out). Call 800-992-7290 or 401-466-5891 or visit the Blue Dory’s web site. The Gothic Inn has four pet-friendly units — one room and three apartments, all with direct access to the outdoors. They have no weight limit on visiting dogs, charge no fee, and require no deposit. They request only that your dog leave her room in good condition, and that you pick up her poop. Call 800-944-8991 or 401-466-2918 or visit the hotel’s web site. One of The Gothic Inn’s innkeepers, Bennet Wohl, mentioned that he has a pet-friendly cottage for rent. Stay in his renovated former barn on a 32-acre farm about a mile outside town, with your own private hike to Fresh Lake. Call Bennet Wohl at The Gothic Inn, or contact Dave Burns at Block Island Holidays (call 800-905-0590 and ask for the Wohl Cottage). The Inn at Block Island has two pet-friendly rooms. Dogs under 75 lbs. are welcome. There is no deposit required, but there is a $25 per day pet fee. When you leave the room, your dog should accompany you, or remain behind in a crate. Call 877-324-4667 or 401-466-5524 or visit the inn’s web site. The Island Home, a charming Victorian B&B located between Old Harbor and the Great Salt Pond, allows dogs in some of its Carriage House rooms, “subject to availability and an additional charge of $25.” Call 888-261-6118 or 401-466-5944 or visit the inn’s web site. Islebliss, on Spring St., is a studio apartment that can be rented nightly or weekly. One dog may join you; there is no additional fee, but your credit card will be charged for damage caused by your dog. Call Block Island Reservations at 800-825-6254 (a brief description of the property is available at BIR’s website). Mason Hall Condo, on High St., has two bedrooms and a full kitchen opening to a cathedral-ceiling living room. Although it appears on the Block Island Reservations’ weekly rental page, it may also be rented nightly in the spring and fall (if you’re planning a summer visit, ask about nightly rentals — no harm in trying!). One dog may join you; again, there is no additional fee, but your credit card will be charged for damage caused by your dog. Call Block Island Reservations at 800-825-6254 (a brief description of the property is available at BIR’s website). The Old Bakery Guest House, on Water St., has two 2-bedroom suites, both opening onto a large water-view deck. Pets are welcome for an additional $50 per night (no additional fee once you reach $150). Call Block Island Reservations at 800-825-6254 (a brief description of the property is available at BIR’s website). The Spring House Hotel doesn’t allow dogs in the hotel, but does allow dogs under 35 lbs. in its condo rental units (Seawind), one street over. There is no deposit required and no pet fee. Dogs are not required to be crated when you are away from the condo. Two of the units rent nightly, with a 2-night minimum; four units rent weekly. They have a “distant ocean view.” They are also darned pricey, but the condos are attractive and packed with amenities. Call 800-234-9263 or 401-466-5844 or visit the hotel’s web site. Unfortunately, several popular Block Island hotels do not welcome dogs, including The National Hotel, The Atlantic Inn, the Island Manor Resort, The Narragansett Inn, and Champlin’s Hotel, Marina & Resort (although it allows dogs in the marina). Many Block Island restaurants have decks and patios, and by calling around I’ve learned that some restaurants are willing to overlook a well-behaved dog lying in these outside eating areas, but the official word is that dogs are not allowed. Size up the situation and act accordingly. Alternatively, consider getting take-out and having a picnic. An excellent and fun choice for breakfast and lunch would be Bethany’s Airport Diner, on Center Road at the airport: they have take-out, and they also have picnic tables. Another option, mentioned in a post on Fodor’s forum, is the Old Harbor Take-Out: “In [Old] Harbor, by the ferry loading dock, there is a food stand with about 12 picnic tables, situated on the street. We had the cold lobster roll, fries and frozen lemonade. Very good for stand food. Maybe the best cold lobster roll I had on the island…” Also consider Rebecca’s Seafood Takeout, at 435 Water St., which is tiny but choice (open for all meals and offers more than just seafood), and Three Sisters, on Old Town Rd., whose terrific sandwiches and salads can be ordered for pick-up (they also have picnic tables). A third alternative is making up a picnic yourself at Block Island Grocery and/or Block Island Depot, both on Ocean Ave. You can get good sandwiches at BIG’s deli counter, and the Depot has good cheese, bread and produce. For hikes, your best resources are The Dog Lover’s Companion to New England and the hikes mentioned on a great site I just found: www.hikewithyourdog.com. 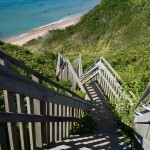 The post for Block Island hikes is truly tempting. Block Island has seventeen miles of beaches, ranging from family-friendly sandy beaches with concessions and lifeguards to rockier, more isolated havens. Here’s a useful list to get you started. Biking is both fun and practical, especially if you’ve taken one of the car-free ferries or a plane to get to the island. Block Island is a bit hilly, but, as my bike-mad father says, there’s no hill you can’t walk up. If you think you’d like to rent a bike on the island, here is a list of bike rental shops. Check out Dog Jaunt’s earlier post about biking with your small dog for dog carriers that attach to a bicycle. Block Island Ferry (call 866-783-7996 or 401-783-7996) runs the year-round ferry from Point Judith to the island. Only the regular ferry departing from Point Judith in Galilee, Rhode Island accepts cars, and reservations for them are required. The crossing takes about 55 minutes. BIF does not charge a fee for dogs; on this ferry, dogs are welcome but must be leashed. Block Island Ferry also runs a seasonal high-speed passenger ferry from Point Judith to Block Island, starting in mid-May and ending in mid-October. On the high-speed ferry, the crossing takes only 30 minutes. On this ferry, dogs must be leashed and must stay outside on the deck. Finally, Block Island Ferry offers a seasonal passenger ferry from Fort Adams State Park in Newport, RI to the island. The ferry starts at the beginning of July and stops in mid-September. The crossing takes about two hours. On this ferry, dogs are welcome but must be leashed. Viking Fleet (call 631-668-5700) runs a seasonal high-speed passenger ferry from Montauk Point on Long Island to the island. The crossing takes about an hour. The ferry starts in late May and stops in mid-October. A Viking Fleet customer service representative told me that dogs are allowed on board but they must be leashed and they must remain outside the passenger cabin. There is no fee for your dog. New England Airlines (call 800-243-2460) offers year-round daily scheduled flights from Westerly, RI to Block Island, hourly in the summer and every couple of hours in the off-season. The crossing takes 12 minutes. NEA allows small dogs to travel on their owner’s lap (a carrier is suggested if the dog could nip). There is no fee for a small dog; a large dog that takes the place of a passenger must pay a passenger’s fare. Only one pet is allowed per flight. What if my dog needs a vet? Block Island Veterinary Services (Dr. Maryann Simonelli) offers vet services by house call, typically one or two days a week. Call 401-466-8500 to make an appointment. In an emergency, call Block Island Veterinary Services (401-466-8500) to see if, by chance, they have a vet on the island. If not, you’ll have to take your dog back to the mainland by ferry, high-speed ferry or plane. Ocean State Veterinary Specialists is a 24-hour emergency care clinic located about 20 miles from the Point Judith ferry landing, at 1480 S. County Trail; East Greenwich, RI 02818 (call 401-886-6787). What if my dog is lost? Block Island Volunteers for Animals is located on Connecticut Avenue, but you need to call first before you arrive: 401-466-5303 (the phone will be answered by a machine, and a staff member will call you back) or 401-466-5343. Block Island is every bit as lovely as its more famous neighbors, Nantucket and Martha’s Vineyard — and like them, it has a lot of deer and deer ticks, and a high incidence of Lyme Disease. I strongly recommend that you talk to your vet about vaccinating your dog against Lyme Disease and dosing her with a tick repellant like Frontline Plus, even if you’re just planning a weekend trip to the island (and of course do a lot of tick checks while you’re there).